Throughout the WGCA’s Premier era, few batsmen have looked more calm and composed at the crease than Kooweerup’s Chris O’Hara. The experienced opener never seems flustered or rushed, but when he’s facing an old foe like Cardinia, his focus seems to sharpen even further. That proved to be the case on Saturday at Denhams Road as the Demons (3/225) chased down the Bulls’ 224-run day one total with 10 overs remaining, and for the loss of just three wickets. In fact, the chase seemed even more emphatic than that. It felt like the Bulls took their wicket-taking chances when they arose, but they just didn’t create enough of them. O’Hara played the leading role for the Demons, while a pair of impressive youngsters also stepped right up to the plate – particularly after the uncharacteristic early dismissal of champion Kooweerup captain-coach Mark Cooper for just four against his former side. Tyler Clark (58) recorded his third Premier division half-century already this season, while Lachie Ramage finished on 40 not out. “Losing a wicket early wasn’t exactly what we had planned, but that happens,” Cooper said in the wash-up of the clash, after he was removed at 1/5. “Tyler and Tubsy (O’Hara) resurrected the innings really well. “The pleasing thing is that we worked with both of them during the week, and they really carried out what we spoke about. “Tubsy stayed composed early and then capitalised later on. “He really stuck to his game-plan, and showed everyone he can still do it. “I guess when you get more experienced, you need to find new motivations and challenges. O’Hara is averaging 41 through his first five innings so far this season, while last year he scored 474 Premier division runs at a shade under 32.
Cooper added that, at this stage of their careers – now that they’re team mates, rather than long-time opponents – he’s just happy he doesn’t have to try and think of game-plans to remove him. He also raved about the performances of Clark and Ramage, adding that the prodigiously-talented Clark has plenty of ability – it’s about maintaining the belief that he can consistently score runs in the Premier grade. Cooper praised Ramage for the “apprenticeship” he did in the lower grades, which held him in such great stead to go on and convert once he got his chance in Premier. This week, the Demons head to Devon Meadows to take on the Panthers in an intriguing battle. The Panthers have no end of potential match-winners, and that’s a fact not lost on Cooper. “It’ll come down to our ability to nullify them,” he said, ominously adding that the Demons are still working out their game as they refresh their list with young talent while still competing at the top of the division. Meanwhile, it should surprise no one that Clyde took a while to launch into the Premier season. 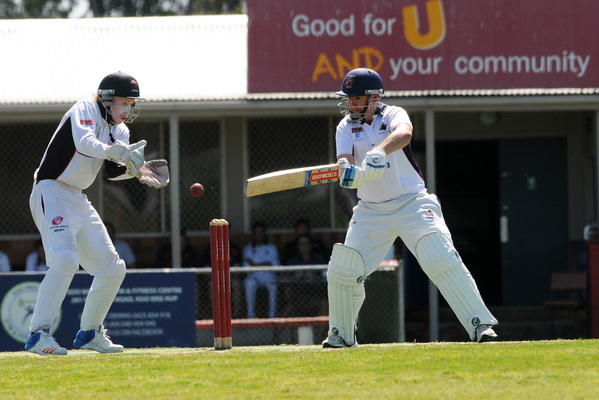 After all, more than half of the Cougars’ first XI is new to the WGCA’s top tier – and that’s including Kiefer Peries and Liam Bennett, who played junior cricket at the club. From the Cougars’ Round 6 side, Matthew Aslett, Daniel Lever, Jason Hameeteman, Warwick Weir, Peries and Bennett are all new to the Premier grade and only Peries has consistently fired to this point. And that’s exactly what makes the group such a dangerous prospect moving forward – its upside is unquestionable. To this stage, the Cougars have lost games to Tooradin, Cardinia, and Kooweerup – three of last season’s top four, and each perennial powerhouses of the WGCA’s top flight. But they’re still only six points adrift of the top four, and Saturday’s win at home over Devon Meadows – currently in fourth – gave a glimpse of what could be yet to come. The Cougars restricted the Panthers to 9/175 from their 40 overs, with only Brad Miles passing 30 in a better than a run a ball half-century (54 from 44 deliveries). Importantly for the Cougars, Lever (3/30) and Bennett (4/26) both had a significant impact with ball-in-hand. In the home side’s reply, each batsman who strode to the wicket reached double figures – with only established WGCA run-scorer John Simpson (12) failing to fire. His was the third wicket to fall at 3/97 before an unbeaten 79-run stand between Peries (49) and Hameeteman (46) guided their side home in the 36th over. Peries’ knock took his Premier season total so far to 208 runs at an average of 52, while Hameeteman recorded a hard-hitting, confidence-building near half-century. Throughout their chase, the Cougars got themselves into a comfortable enough position that they really only needed one big late over to clinch the win. That proved to be the 33rd, with 13 runs coming from it. As Hameeteman freed his arms in the latter stages of the innings, he seemingly gained confidence with every delivery he faced. Undoubtedly, Clyde’s biggest challenges this season are yet to come – starting with their back-to-back clashes in Round 7 and 8 against Pakenham before the Christmas break. But, still, the Cougars are showing steady signs of improvement. “I just think everyone defined what their role is in the team,” Simpson explained about the group. “In most games we’ve played well in patches – with bat or ball – but we haven’t put a full game together. The same applies to the hard-hitting Hameeteman, who’s given WGCA District division bowlers constant headaches in recent seasons. Last year he led the division with 629 runs at an average just a shade under 70. But the question was always going to be how well that form could translate when making the step up to Premier. “We’ve played against him in the past (when Hameeteman was at Carlisle Park) – we know how he can bat,” Simpson said. “He can do the same thing in Premier as he did in District – it’s about backing himself. Speaking on Saturday’s win, Simpson said his side was fortunate enough to snare the wickets of danger men Scott Clark (8) and Miles in quick succession – which proved to be crucial in restricting the visitors to a sub-200 total. Simpson praised the performances of Peries so far this season, saying his play – both as a batsman, and wicket-keeper – had clearly benefited from his years in the Victorian Premier system. “You watch the way he bats – he takes his time and doesn’t just give his wicket away,” he said. “He knows that he can score runs later. Simpson added that Peries’ performances had allowed the Cougars’ batsmen at the other end to free their arms and play that little bit more aggressively. “If you know at one end you won’t lose wickets, you can be a bit more aggressive,” he said. But Simpson, and the rest of the Cougars for that matter, are well aware of the challenges that await them in the coming weeks. “We’ve got Pakenham for the three weeks with the back-to-back games, but I think the guys are feeling a bit more confident,” he said. “It’s a good test right in the middle of the year – if we can compete against Pakenham, then it really sets us up. “I think Kooweerup and Pakenham are the two most likely to be in the finals, but apart from them Cardinia, ourselves, Devon Meadows and Tooradin are all pretty even. 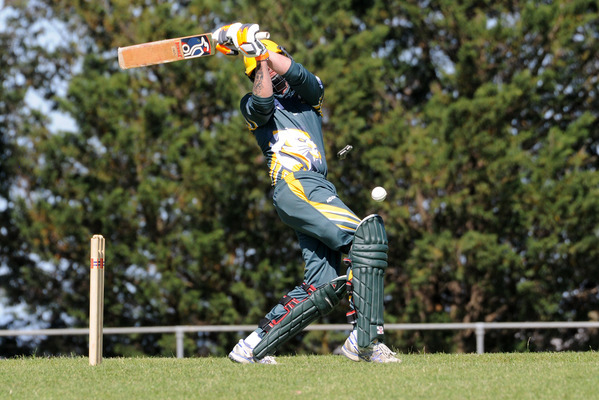 Elsewhere in Round 6, Pakenham’s hopes of a rare outright win were quashed courtesy of a stoic Cobras batting performance at Donnelly Reserve. Gagandeep Sharma (52) and Daniel McCalman (62) both recorded half-centuries to play a key role in their side reaching a gallant 229 in a shade under 75 overs. 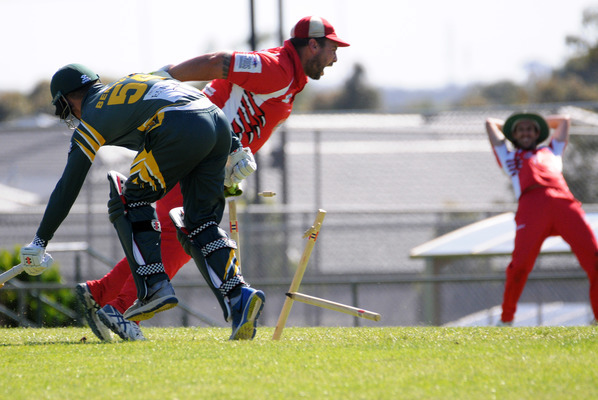 Lions star Dale Tormey backed up his unbeaten 177 from the week before with 3/41 from his 12 overs with the ball. Tom Tyrrell (2/47) and Troy McDermott (2/6) were Pakenham’s other multiple wicket-takers. At Upper Beaconsfield, meanwhile, Tooradin recorded a thumping win over the struggling Maroons. Seagulls openers Brody Harbinson (88) and Russell Lehman put on a whopping 178 for the first wicket, with Lehman in vintage touch with his unbeaten 133. Andrew Proctor (19 not out) also provided a late cameo to help the visitors to a dominant 3/269 from their 40 overs. The Maroons were never in the hunt in their chase, and finished their 40 overs on 8/134 with opener Daniel Brennan (53 not out) their only batsman to pass 25. Bailey Lownds finished with a miserly 2/9 from his eight overs for the Gulls, while Cal O’Hare claimed 2/27.